By SailorJM, February 12, 2010 in What Ever Happened To........??? We sailed Wind Star out of Costa Rica in mid-January, and there was Legacy, sitting sadly alongside Wind Star...being pumped out. Very sad condition. Wind Star crew said that the week before, Legacy, which had been anchored in the harbor since mid 2007 when sailings stopped, looked to be sinking. They said she was listing way over and deep into the water. She was brought to the dock, and when we saw her, was being pumped out. Our captain went aboard and reported they pulled 100,000 gallons out of her. But a bit of good news he also shared: she apparently has been bought be an individual, but no info as to that man's intentions. Here are some photos of her, as of mid-January. Here is one more photo of Legacy, taken as Wind Star set sail in early evening. The pictures are so sad but thank you for posting them. We sailed the Legacy a few years ago and although she was our least favorite Windjammer ship it is hard to see her so neglected. Very happy to hear that the Legacy was purchased and someone might be able to save her. I believe the captain said a man from Panama had bought Legacy. I tried to find info on the Internet, but no luck. We never sailed Legacy. We were set to do so, but that's when you-know-what hit the fan. We fortunate to get all of our money back via the credit card co. Our favorite was Mandalay. Did you know she was purchased by Angermeyer Cruises and is being re-conditioned and will be sailing the Galapagos--still to be named Mandalay? Don't know when, but glad to hear it! Thank you for posting those pictures. How sad! 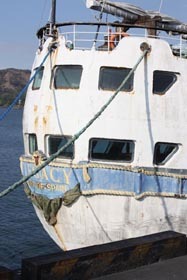 I sailed on the Legacy in 2001 and Feb 2007 and also the Mandalay in 2004. They were the 3 best vacations I ever took. In Feb 2007 I knew something was going on- the ship was just not in the pristine condition it had been in when we sailed in 2001. I also saw the Poly in Aruba 2 years in a row. Also looked in bad condition. A ship called the "Diamont" is now sailing in the Grenadines with Capt Matt who sailed the Mandalay when I was on it. I think it is called the Island Windjammers. Capt Neil had something to do with getting the ship. 6 guest cabins and the price is pretty fair-about $1600 pp with all meals, beer and wine. Julie, Our favorite WJ ship is the Mandalay also and were fortunate to sail 3-13 day cruises between Antigua and Grenada plus the Panama trip in July 2007 when she had her bowsprit broken off. 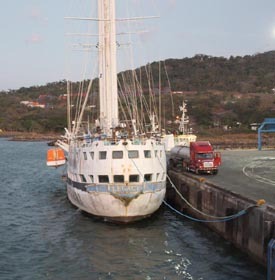 We hope to sail her again in the Galapagos Islands. Earlier this year they had availabilty posted on Angermeyer's website for June, July and August but now they show no availibility at all. We also sailed the Polynesia, Flying Cloud and the Fantome and partied aboard the Yankee Clipper. All of these beautiful historic ships will have a place in our hearts forever. Some serious Jammers here! Thank you for the info about Capt. Matt. He was our captn on Mandalay and I have wondered about him. I knew that some of the longtime Jammers had formed Island Windjammers, and have wondered how it is going. Glad to know Capt. Matt is onboard there. We were just becoming serious Jammers when it all fell apart. Had sailed Mandalay and Poly and were about to sail Legacy. We also sail Star Clippers, which are close, but not Windjammers. Going to keep up with Angermeyer and Island Windjammers, as well as Cruise Arabella, another with masted sailing ships (cruisearabella.com). We cruised with Captain Matt several times, the first time we met him he was Captain Adrian's First Mate on our Flying Cloud cruise in the BVI's, gotta love him. He was on the Diamant when they started sailing in November but I believe he is on vacation now. Captain Stewart has been captain for the past month or so. 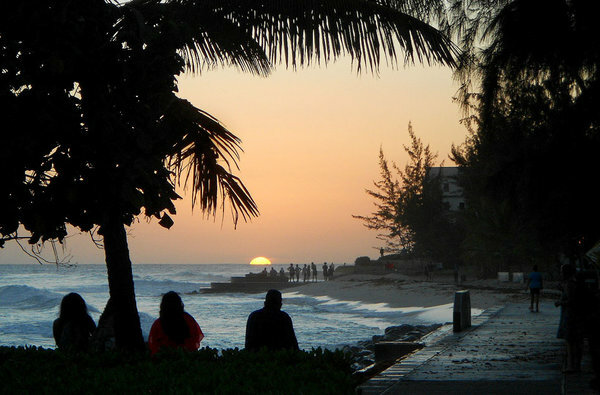 Matt left WJ before the end, he was building a house in Bequia but moved back to Minnesota. We were thrilled that he was sailing again, it gets in your blood, I sure do miss those wonderful ships. We get post cards from Arabella all the time but we are holding out for the Mandalay. Wind Star is lovely, how is the passenger mix? Everyone was so laid back on WJ, that was part of the appeal. Great passengers on Wind Star! Lotsa fun. Have also sailed Wind Surf, but it is too big for us. Wind Star more like WJ where you get to know just about everyone, but the WJ feeling of being among friends from day one, well that is what I really miss. Wind Star crew excellent and fun, but not a WJ crew, if you know what I mean, and I'm sure you do! Yes, as an ex RN man it is sad to see a ship such as this (Legacy) go to waste. Lets hope any future owner(s) keep her in the glory she is accustomed to. I didn't have the time (or opportunity) to sail in all the Windjammer fleet, but a chance meeting with a lady employee (of Windjammer) in the Beacon Hotel, South Miami Beach in March of 1990 had me book a cruise for late December of that year aboard The Polynesia. I wasn't disappointed!! 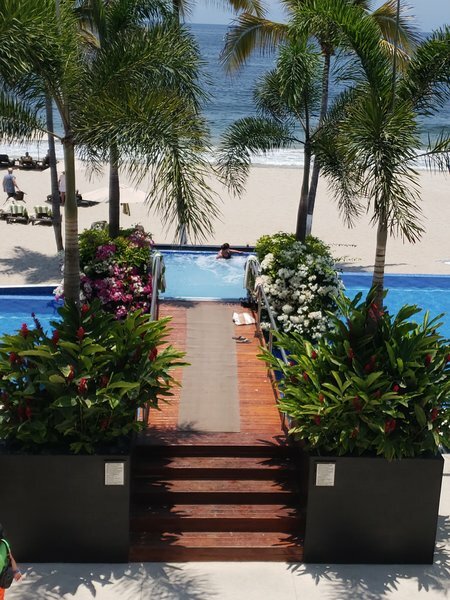 I think anyone who experienced that trip would agree and if any existing cruise line can match the laid back, welcoming atmosphere prevalent on that ship then I am all ears. I have some good photogtaphs of The Poly that I will post in future. A fair wind and a following sea to all. Apologies. I'm new to this forum. My first posting re Windjammer (in general) was meant as a reply to SailorJM regarding Legacy. You did fine....thanks for your post! 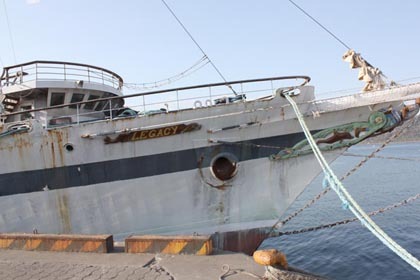 The latest news posted on the Flotilla is that the sale of the Legacy fell through, the buyer must have backed out. 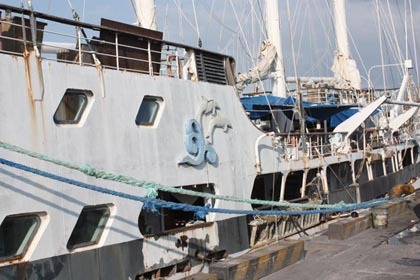 They are saying that the ship will be "parted out" by the Costa Rican government. Such a shame :< I was hoping she would be saved from being scrapped. Oh no....that is really sad. But I am sure that the 100,000 gallons of water that they pumped out of her in January didn't do her any good, and that may have been why the buyer backed out. Too much interior damage......? Thank you for this news.... very bad news!!! Please excuse my bad English level. I was interested by this post because Legacy fist name was "France 2", one of the two last French weather ships. "France 1" stays in La Rochelle Maritime Museum (France). And we usually give information about what "France 2" became to visitors. I am not sure we are talking about the same ship, if the photo you posted is the ship you refer to as the former Legacy. 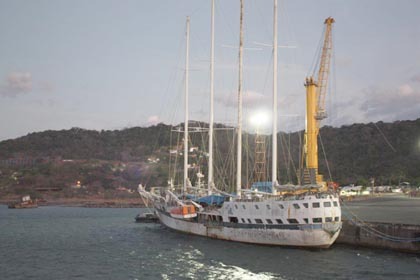 The ship referred to in this thread is Windjammer's Legacy, a multi-masted sailing cruise ship. See photos with initial post. That is correct, actually. There are photos of the Legacy when she was still the France 2 in the book "Barefoot Pirate: The Tall Ships and Tales of Windjammer". She was the only one in the fleet that was converted like that. The La Mer was supposed to be the second, but that never happened. ETA, the picture above is of the sister ship the France 1. If you are on Facebook, "Windjammer Sailing Fans" has photos of the Legacy being cut up. The last one shows the figure on the masthead on a pile of rubble. So sad, what a dirty rotten shame. This is incredibly sad. We went on one Legacy cruise and had an absolutely wonderful time, wanted to do more "jammin", but just not meant to be. A great example of a wonderful idea ruined by poor management. We go on foo foo ships now,and have lots of fun, but wish the alternative was still available. 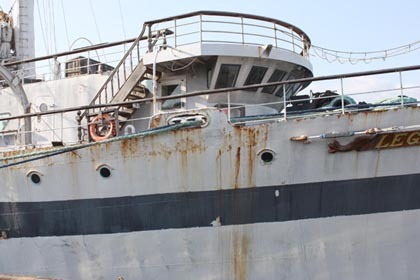 But I'm still hopeful that Mandalay will have her day again soon, that Angermeyer Cruises will continue her renovation. I'm guessing that Poly will be the next to be scraped. Sigh. I get post cards from Arabella all the time, looks beautiful. Fiddi Angermeyer is not sailing the Mandalay any time soon, he is concentrating on the MaryAnne but he reduced the rates recently, business must be slow. The Poly is safe and back home in Portugal, she has been restored and is well cared for. The only one still in danger is the Yankee Clipper in Trinadad. 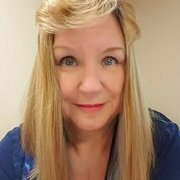 Nancy, thank you for your updates on the WJ boats. I take it that Poly is now private? You really should consider an Arabella cruise. She is our new "favorite best tall ship." Altho we just got a cruise special offer from Star Clippers in the mail yesterday: very tempting (have sailed their ships twice....falls somewhere between a Windstar and a WJ) offer. If we hadn't signed up for the Feb. 27 Arabella cruise in Spanish Virgins.....wish we could do em all! Still have hopes for Mandalay, some day. Julie, we are holding out for Mandalay because we love her so much! We would have gone next year to the Galapagos but with her bookings not available we booked a European River cruise from Amsterdam throught Germany on the Rhine. Main and Danube and through Austria to Budapest Hungary on a small ship that holds 140 passengers. No sails but it is a fabulous trip so that is what we are going to do. If the Mandalay is ever ready to book passengers we will sail her again. 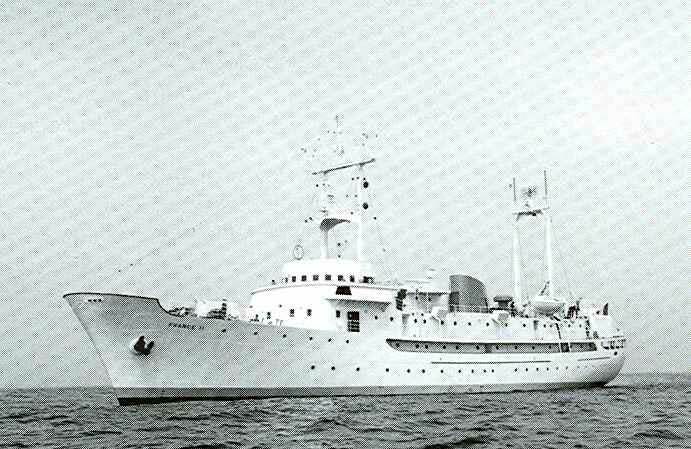 The Polynesia is being used as a cadet training ship for the government of Portugal replacing her sister ship that has been turned into a museum. She is back home and well loved.